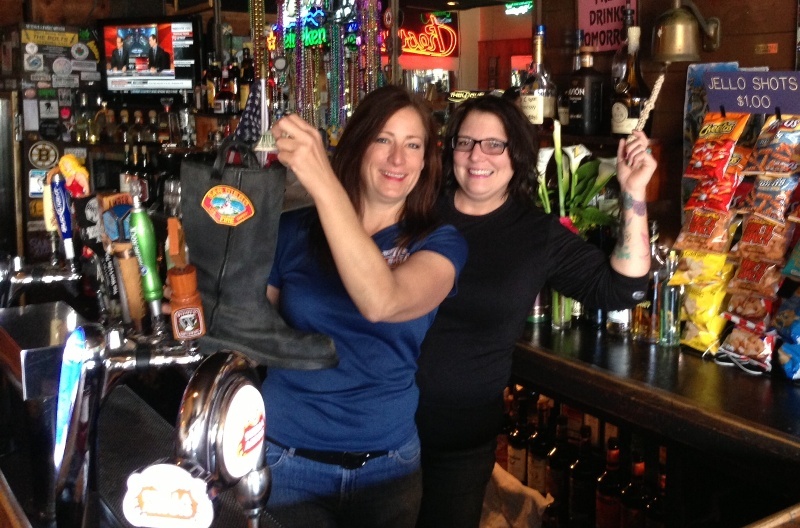 Cheswick’s West bartenders Allie Shea (left) and Shelly Hutchison ring the bell and pass the boot to help the Fallen Firefighters Foundation. For years, Cheswick’s West bartenders Allie Shea and Shelly Hutchison would ring the bell behind the bar whenever one of the local fire trucks would drive by on Newport Avenue to show their love. Now they do it with a purpose: To raise money for the Fallen Firefighters Foundation (link). That’s because every time one of the trucks drives by, the bar passes around the firefighter’s boot they have perched behind the bar for everyone to donate. “Every time they drive by, we ring it. People love it,” Hutchison said. The idea to raise money came about after Shea took part in the San Diego Memorial 911 Stair Climb at the Hilton Bayfront last year. More than 900 people gathered to climb 110 stairs in honor of the firefighters who died on Sept. 11, 2001. Shea trained on the beach in OB, walking up and down the stairs at Garbage Beach near Ladera Street. She says it has been part of a rejuvenation of sorts for her. She quit smoking, starting riding her bike and has made herself a healthier person. So she was ready for the big day at the Hilton, which entailed climbing up and down the stairs three times. She had been working hard to get donations too, but wasn’t exactly sure what to do next. “I showed up with $500 in cash. I didn’t know where to put it,” she remembers. She said one of the organizers helped her with the donations and within the hour she got a call from someone at the Fallen Firefighters fund thanking her. The firefighter boot was donated by the Stepanof family at the Coronado Fire Department. Now the fund is close to $1,000 and Shea thinks it will keep growing fast. “By next year, we’ll have a couple thousand,” she said. Todd Barry, a firefighter with Fire Station No. 15 on Voltaire, says they have made it a part of their routine. Now the trucks from the Point Loma and Sports Arena make runs by Cheswick’s. “They’ve gotten in on it too. They love the glory of the bell and everyone waving,” Shea said. Barry said it’s heartening for his firehouse mates to see the generosity of the people at the bar. Shea hopes it will keep people thinking about the plight of current and former firefighters more than just when there’s a crisis. Awesome & very cool! Great article! She had been working hard to get donations too, but wasn’t exactly sure what to do next.